While my husband, Jack, does not often cook, there are two or three dishes he prepares quite well. Baking, however, is unexplored territory. So, when he bought the ingredients to make this pie a few months ago, I knew he must really love it. As he toiled in the kitchen, I tried not to comment on his “technique” but had to speak up when I noticed he was about to add canola oil instead of corn syrup to the mixing bowl! 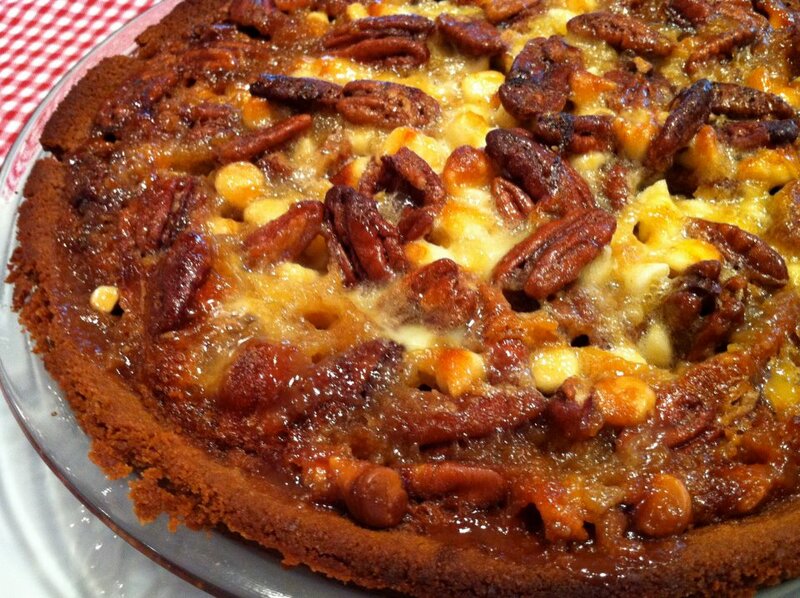 White chocolate adds something unexpectedly delicious to this pecan pie. For added convenience, the ingredients mix up quickly in one bowl. Short of using the wrong ingredients, this dessert is bound to be a winner! This recipe is what I call an “oldie but goodie”. I first posted it on The Fountain Avenue Kitchen site last winter and made it again for a Kentucky Derby Party….okay, and maybe a time or two since! Because it is a tasty alternative to a traditional pecan pie on the Thanksgiving table, I thought it fitting to repost. This time, I am formatting it with my print option for added ease. If you try, I hope you enjoy this treat as much as my family does! This recipe was adapted from a Cat Cora recipe. This recipe was shared with Chocolate, Chocolate and More Chocolate’s Thursday’s Treasures. Layer pecans and chips in pie crust. Mix remaining ingredients in large bowl and pour over pecan mixture. Bake at 375 degrees for about 40 minutes, or until filling is set in center, covering with a lightly-oiled piece of foil after the first 10 minutes to prevent crust from over-browning. Cool completely. Top with a dollop of whipped cream, if desired, and savor every bite!! I recently installed a print option so the newer recipes may be printed. I know it helps! For the older recipes, you can highlight the text, then copy and print it that way. Hopefully, that will help! I’ve seen tons of recipes for chocolate pecan pie but never one for white chocolate, can’t wait to try this! Pinned. Thank you, Joan! My pecan pie loving husband was the inspiration behind this one. Hope you love it as much as we do! Is there any thing that can be substituted for the corn syrup ? Good question, Susan. This is probably the only thing for which I use corn syrup and take the everything-in-moderation approach with it! If I were to experiment, I would try honey first. I hesitate to recommend it though since I have not done it. If you make any adaptations, please let me know! You can use granulated sugar, or light brown sugar, honey, or molasses. If you use granulated or brown sugar, increase by 1/4 cup. If you use honey or molasses, use the same amount the recipe calls for. Thank you so much for looking into all that for me ! I really really appreciate it ! You are welcome, Susan, and I hope you enjoy! Oh dear it does use eggs, well still plan to make it! I wish I could offer another option, Susan. I hope it goes over well nonetheless! Happy Thanksgiving! You can use maple syrup instead of corn syrup. Thank you for the suggestion, Jodie! *LOL*!! When I first saw this I thought it had “corn” It….thats what the “yellow” looks like!…*LOL*..especially when men are cooking, it could have happned!!.. *LOL*….love this and am wishing you and yours a HAPPY THANKSGIVING!!! Thank you very much, Kellie! Wishing you a wonderful Thanksgiving, too!! WOW…this looks so good and i can hardly wait to try it! I recently discovered you on facebook and now i’m hooked. So many wonderful recipes! THANX. Thank you for the great message, Cathy! I am so glad you found me and hope you find many recipes you enjoy! My pie did not set up. Why? Used 9 inch pie shell and covered. Put in oven on baking pan. Could this be the reason. Removed and baked about 30 more minutes . Still not totally set up. Can you help me. Hi Linda, After all that time in the oven, it’s somewhat perplexing. Was the baking pan on which you placed the pie insulated? Or could your oven temperature possibly be off? How did the pie seem after it cooled? It was just a cooking sheet, like I bake cookies on. Does appear set now that it is cooled. Not sure how the outer part of the pie will be as it is browned. Next time I will just put it in the oven as it did not cook over. I do think the pan was the main problem. Thanks for getting back.